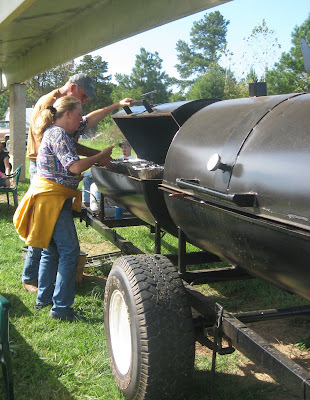 Mack loaned his big deluxe barbecue cooker for the 18th year celebration of the farmers keeping the hazardous waste dump out of Rowan and Iredell counties. 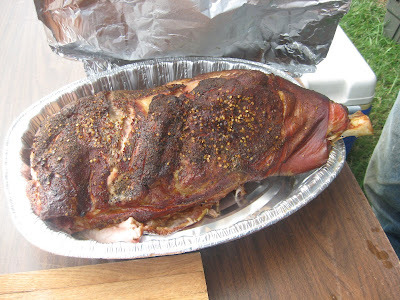 The farm guys planned the party and cooked up some fabulous smoked barbecue pork shoulders. This is a very traditional Southern barbecue meal with smoked pork, slaw, and beans. 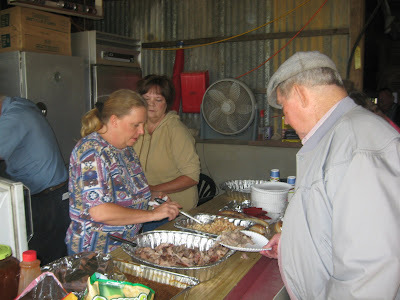 The big barbecue party was held at a local farm and was relaxed and informal. 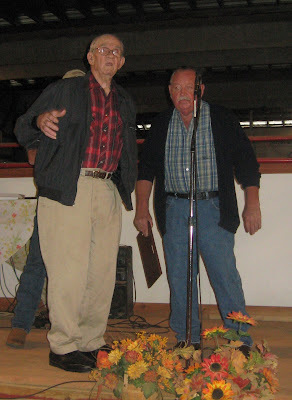 Papa Clyde and Jones were honored for their work in keeping the hazardous waste dump out of the middle of farm country. Back in 1990, the state (NC) decided they'd plop a hazardous waste dump along the Rowan and Iredell county lines in North Carolina. This did not sit well with the farmers in the area. They didn't want to lose their land and lifestyle and sure didn't want a hazardous waste dump right there where the kids would be growing up and where everyone would be getting possibly tainted milk. Really now . . . who knows what that hazardous waste does to an area and to the food supply. The hazardous waste dump was supposed to be a done deal, but the state officials underestimated the locals. The state guys thought they were dealing with country bumpkins and that they could roll right in with their big machines and put in a big dumping ground. Country folks banded together and determined that the government wasn't running right over them and taking their land. They signed petitions, called the government, talked to the media and literally joined hands for a human chain to stop the development. This show of solidarity was quite serious. And, the area farmers weren't kidding. After a few months, the state gave up and left. This was all 18 years ago. Those involved in stopping the hazardous waste dump from being plopped in the edge of the county out on our farmland still get together to celebrate the victory and to make sure their kids know about this part of our history. 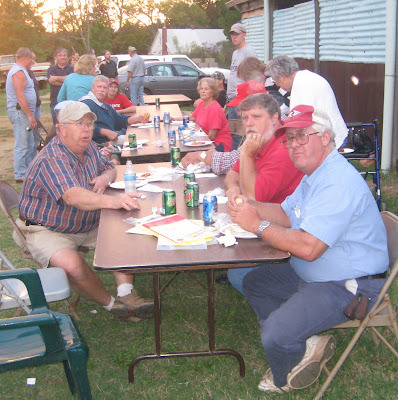 Today, there was a barbecue to honor Papa Clyde of Iredell County and Jones of Rowan County. Both men were "generals" in this fight against the state and helped organize the protests. Today they were given plaques for these efforts. One farmer said, "We did things that the State didn't think we could do. This community come together 100%. Maybe we ought to go to Washington and get them all straightened out." The response to that was a resounding, "A-men." Amen on going to Washington. The need a little straight talkin' up there in DC from time to time.